Hi guys, does anybody got issue redeeming the vitaly move vouchers @ pick n pay ? I assume you refer to the weight loss? I'll try keep a long story short. Sedentary life style, loved food too much, enjoyed social drinking. Have been 140kg or so for years. 1.86m tall, in my early 40's now. When my 1st child was born, I held her in my arms for the first time and promised her I'd not be the fat lazy Dad etc. Nothing changed. My 2nd was born, I told him the same thing. Nothing changed. She turned 5 this Christmas and he's 1yr 5m now. Basically a few things in a row finally helped my brain flick the switch. It was for me, not my kids, not my wife, but for me. For me to be healthy, for me to live as long as possible to enjoy my wife and kids and to enjoy life to the fullest. Every 12 week challenge I ever did had a finite goal. At the end of the 12 weeks, after all the blood, sweat and tears were done, the goal was over and I needed a break, needed to reward myself. Always went straight back to where I was. Those crash course challenges were not sustainable for me. One Sunday afternoon in August, having a lazy beer and braai day at home with mates. Got told about a friend of a friend who sounded just like me, weight and activity wise. He'd lost 40kg's in 9 months. I was interested. I listened to the details of what he did and the day went on. I must have soaked it all in. I woke up the next morning and started making a fairly healthy breakfast. My wife asked me what I was doing. I said I think I'm going to try eating a bit better. I didn't stop. So, what I changed was. What I eat (I eat normal meals/food including potato, pasta, a pizza once a week etc) and portion control (not simply filling my plate like a madman but a reasonable portion). I cut out bread, sugar, take outs and alcohol. I realised it's simply all about calories. If I want to lose weight, less in than what is being burned. For the first week I was fairly hungry as my portion sizes decreased, but after that my body adjusted and now my portions are completely satisfying. I am not obsessed about my weight, I did and still only weight myself every 2 weeks. Last time I weighed myself (day after coming back from a 3 week holiday away) I was 117.5kg. I even lost 1.8kg over my 3 week holiday. For the first 6 weeks, I changed zero with respect to exercise. I had lost 8kg's or so by simply stopping eating like a teenager. I started feeling better, sleeping better, had tons more energy and naturally began feeling like doing some exercise. I joined a friend for a parkrun. I walked/jogged that 1st one and got a time of 49m40s/5km. I kept at it most Saturday and really started enjoying it. I now run 5km three times a week and am averaging 34m/5km. This is my weight chart since starting (attached). The little bump upwards (between September and October) is an error in the stats when I moved over from tracking my data on Fitbit and moved to a Garmin device. Back from holiday on Saturday after eating a lot of rubbish and back to normal on Sunday morning, good, wholesome food of reasonable portions. I did not stop my runs while on holiday. That's my story so far. My goal weight is somewhere in the 90's. Not totally fussed until I get there and see what's good for me. Important part for me is that it's totally sustainable, easy and I'm still loving the food. Well done and major respect. I’m wanting to book accommodation shortly for Sun City. The 35% seems too good to be true... So far have just seen a small booking fee when looking at quotes via the disco/kalula portal. Is there anything I should watch out for when booking travel? Yes, to enjoy the full discount you have to book (well) in advance - I think it's 21 days otherwose the discount is 10%. What would be the cheapest? What would be the closest to having a smart watch? 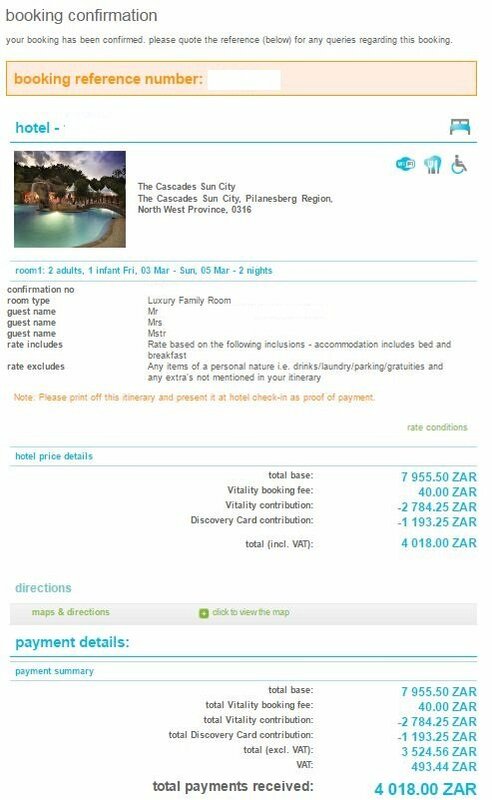 I usually do a comparison with the resort price versus the kulula discounted price, sometimes there are discrepancies between the original price before discount. The last time it was spot on, booked for breakfast and dinner included and got 35% off the entire bill.....bonus. Do you have to have a Discovery credit card to take advantage of the discount, or is just being on Vitality fine? I'm also looking at airport transfers and they are absolutely crazy. Seems like its cheaper to hire a car and have it parked for 5 days while at the resort than it is to take a shuttle to / fro that i may miss due to a flight delay. Note - i haven't booked yet... but the discount afaik is available without me having a Discovery card. Wonder if i booked with my dads account (he has a discovery card) - i may get a bigger discount? There used to be an additional discount if you paid with a Discovery Card but I am not sure if it works anymore. Took the discount up to 50%. My tenant is an Uber driver. I usually contact him directly for my longer trips. Pm if u want his details to get a price. You mention eBucks, so I assume you bank with FNB. IF you are on PC or above, you qualify for eBucks Lifestyle and get some free AVIS P2P transfers. I don' t think you will get all of that and have it be cheap. All that comes to mind is the Fitbit Versa which at its cheapest is around R2800. With HealthyCare or HealthyGear discount you could get R500 cash back** on the purchase from Dischem/Sportmans respectively. **[Assuming you don't buy anything else from them that month]. Also what smartphone do you have since the device in question needs to sync with your phone. The Versa for example doesn't play nice with some or possibly most of the Huawei phones. If you get a watch on the device booster list, you can get up to 75% cash back, assuming you get all your weekly goals and you do a fitness test. You forgot the "over 2 years" bit. So you'll get 1k back end of that cycle and like 90 bucks a month for the next 23. To add onto the 2 years bit, there is also a cap on what you get back ( I believe it's up to R4k ). Just make sure you shop around for your devices before going with sportmans and device booster. I found my device significantly cheaper at Cape Union. Yeah, my math was based on that, but yes that is also assuming the device is 4k or more. What did you find that was more than 25% cheaper, that's quite an impressive difference.